SOLO, Indonesia — In Indonesia’s recent local elections, Hadi Rudyatmo, a former sidekick of President Joko Widodo, seemed set to easily retain the mayor’s job in this city of around half a million people in central Java. But that does not say much about the current standing of Widodo himself in the national political scene. The nationwide vote for mayors and other local government positions was staged on Dec. 9. Although the country’s election commission is not due to announce results until Dec.18, provisional results indicate that Rudyatmo is likely to win Solo with around 60% of the vote. Siska Sitiawan Sanjaya and her brother Sandro voted together in central Solo early on polling day. Both opted for the incumbent who, like his better-known predecessor as mayor and current president, Widodo, goes by a nickname. Solo, Widodo’s hometown where he was mayor from 2005 to 2012, has long been a stronghold of the Indonesian Democratic Party of Struggle, the biggest party in the national parliament. Together with Widodo’s profile as president and track record as mayor, it meant that Rudyatmo was unlikely to lose, although the opposing ticket tried to play up the fact that the mayor is a Catholic running a city that is mostly populated by Muslims. Elsewhere, high-profile incumbents such as Tri Rismaharini, the mayor of Surabaya — a sweltering, traffic clogged city of around five million people in eastern Java — won as expected and with a whopping 85% of the vote. Bu Risma, as she is known, earned international plaudits for her forthright reformist moves as mayor — efforts which included the shuttering of “Dolly,” a seedy part of Surabaya often described as the world’s biggest redlight district, as well as cleaning up public parks and streets in a manner reminiscent of Widodo’s own efforts during his time as Solo’s mayor. Other figures who seemed set to retain their positions were Airin Rahmy Diany in Tanggerang, west of Jakarta, and Irwan Prayitno, the governor of West Sumatra, as well as Dzulmi Eldi, the mayor of Medan, a major city in the north of Sumatra. For the most part it appears that many voters wanted to retain those leaders who had introduced popular initiatives while in office, though some edged toward giving the rival candidate their vote. “That’s better than those who want to change for a new leader, just because he’s new,” said Widodo, a shopkeeper in Yogyakarta who shares the president’s name. One major city where the mayoral contest seemed too close to call is Semarang, on the north coast of Java, where the outcome of the contest between former mayors Hendar Prihadi and Soemarmo was heading right down to the Dec. 18 official results announcement. Altogether about half of Indonesia’s districts and municipalities voted on Dec. 9, along with around half of the country’s provinces. The remaining regions will vote in two blocks of elections in 2017 and 2018, including five elections that were due to take place on Dec. 9 but were eventually postponed. 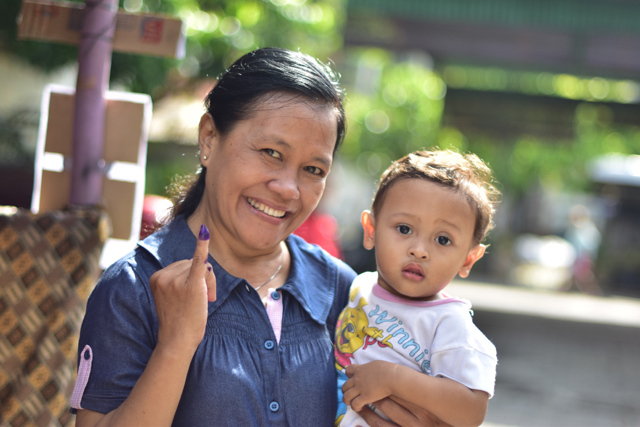 Indonesia has held direct elections for heads of local government since 2005, as well as elections for local parliaments, the latter taking place simultaneously with national parliamentary elections. Around 100 million of Indonesia’s near 200 million voters were eligible to vote, choosing from 800 candidates. But while a national holiday was declared for voting day, turnout is likely to have fallen short of the 70% turnout in the 2014 national elections, according to election observers. “We have not seen as much interest in these elections as in 2014,” said Khairul Anshar, who recently set up Kawal Pemilu (Regional Elections Watch), an online election results monitoring service, after last year working on a similar initiative for Indonesia’s national elections. Even so, the sheer size of Indonesia — with over 6,000 inhabited islands spread across more than 5,000km, from Aceh in the west to Papua in the east — means that local elections have perhaps greater significance there than elsewhere in the region. Indonesia is highly decentralized, with powers devolved to local level after the fall of the three-decade-old Suharto regime in 1998. Approximately one third of the state budget is disbursed to the regions for spending locally and local leaders have a big say in investment projects in their regions. Decentralization, although necessary in such a dispersed archipelago, has spawned corruption in the provinces, say analysts. Indeed, hundreds of elected local leaders have been charged by the national anti-corruption commission, known by its Indonesian acronym of KPK, in recent years. A constitutional court ruling earlier in 2015 allowed those accused of graft to run for office. Although opinion surveys regularly show Indonesians to be concerned about corruption and indicate that the KPK is one of Indonesia’s most popular public bodies, officials accused of graft can still win at local level. “Familiarity matters. Most voters do not feel they want to find out much about the candidates’ background. This is why many ex-convicts ran in different areas,” said Ulla Fionna, an Indonesia analyst at the Institute of Southeast Asian Studies. Before the vote there were concerns that the widespread vote buying that marred the 2014 national parliament elections could be repeated. Even so, money clearly played a part in the recent polls, with candidates close to big businesses running and winning. Candidates need money and therefore seek support from the major national parties in order to run — often in configurations that do not reflect party coalitions in the national parliament in Jakarta. It all means that these local elections – though widely seen as a vital part of Indonesia’s comparatively young democracy — cannot be taken as a bellwether for national level politics, much less as a referendum on the Widodo government, which took office just over a year ago. 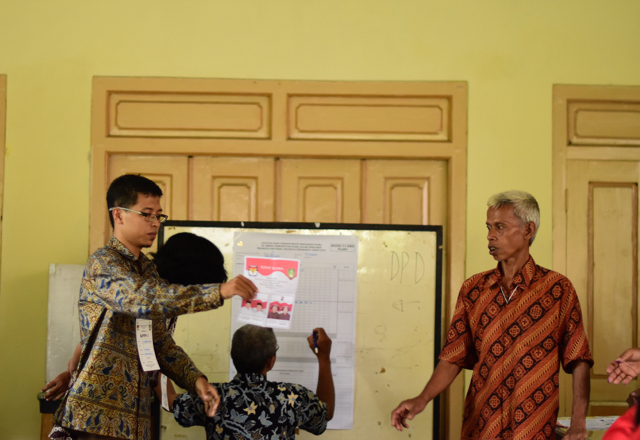 “Coalitions are fluid and different than at the national level, and there is no particular pattern so far,” said Ulla Fionna, who observed the elections in eastern Java. Despite the historical dominance of a Jakarta-focused political elite, for the 200 million-plus Indonesians scattered across the archipelago, sometimes thousands of kilometers from the heaving capital, the intrigues and posturings of national politicians are irrelevant to voter choices at local level.